Trail riding should be fun and relaxing, but every rider should follow some basic etiquette while on the trail and sharing it with others. Riding in a single file line is usually safest with a group of riders. It is wise to keep about a horse length in between horses, especially when riding with horses you do not know. Always pass another horse with plenty of room and in a controlled manner. Crashing through the bushes to pass another horse is just asking to put the other horse and rider in an unsafe position. Do not hold branches as you pass and let them snap back in the face of the horse or rider behind you. Gently push them as you go by and warn the rider behind you there are branches. Do not snap off branches that are in the way without warning the rest of the riders. The noise could spook the other horses. 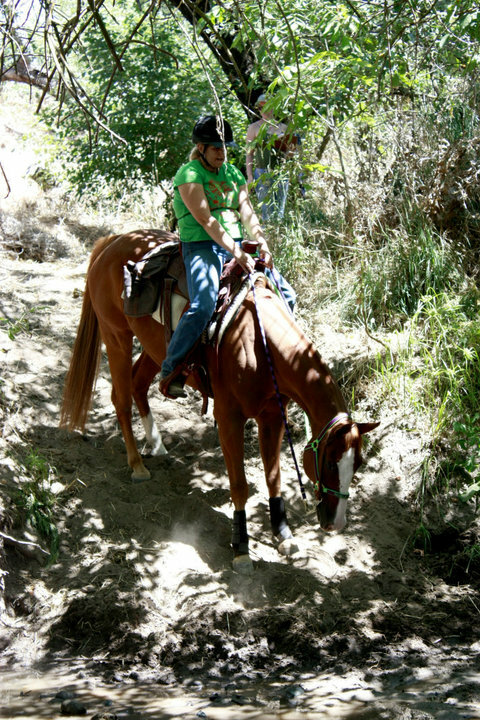 Horseback riders typically have the right of way on multi-use trails. However, be courteous of all other trail users, but do not be afraid to speak up. Many bicycle riders and joggers use head phones and can not hear you or your horse. Always make sure to okay any change of speed with the rest of the group. Trotting or loping off without warning can put other riders in danger.